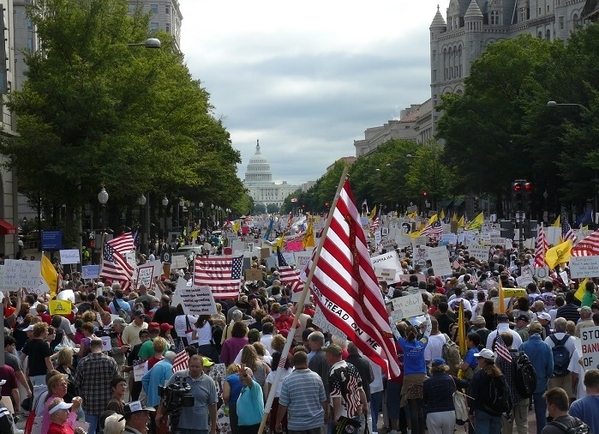 Tea Party protesters throng the National Mall during the Taxpayer March on Washington on September 12, 2009. I ADMIRED the Tea Party. I regarded it as the most impressive American grassroots political movement in my adult life. I cheered its rise to influence in 2009 and 2010, applauded its focus on curbing government's exploding budgets and trillion-dollar deficits, and shared its opposition to the massive overreach of the Affordable Care Act. I defended it against scurrilous attacks from unhinged liberals, who demonized its members as segregationists, terrorists, and arsonists. And now I mourn its demise. To be honest, the Tea Party has been a dead letter for a while. Its political high-water mark came in the 2010 midterm elections, when Republicans picked up 63 US House seats in a sweeping landslide. Its greatest policy achievement was the "sequestration" agreement and Budget Control Act of 2011, when President Obama was compelled to accept across-the-board reductions in discretionary spending in exchange for getting Congress to approve an increase in the federal debt limit. Alas, party politics proved fatal to the movement. "Inertia pulled us toward partisanship," writes Matt Kibbe, an early Tea Party organizer, "and over time there was growing pressure to support the party, not our principles." Consequently, not much remained of the Tea Party afflatus after Mitt Romney's presidential campaign of 2012, and what little vitality it had left was completely drained by Donald Trump's hostile takeover of the Republican Party four years later. "Under Trump," Kibbe concedes sadly, "the Tea Party original agenda of freedom and fiscal responsibility has been replaced with a populist nationalism that doesn't particularly prize spending restraint." If there were any lingering doubt on that score, it was wiped out by last week's bipartisan budget binge — a $400 billion debauch of new spending that makes a mockery of everything Republicans have ever said about the need for fiscal discipline and how they're the party to impose it. This wasn't a budget forced on a GOP bargaining from a position of weakness; it was a deal embraced by the party that controls both houses of Congress and the White House. And that was before Trump sent Capitol Hill a budget blueprint for 2019 that proposes to spend another $200 billion on public works. When Obama was president, Republicans — spurred by Tea Party activists demanding more individual freedom and fiscal integrity — loudly sang the praises of balanced budgets and smaller deficits. "We have a debt crisis staring us in the face," Paul Ryan told "Meet the Press" in 2011, when he was the House Budget Committee chairman. "The problem we have is spending, not taxes. We've got to get our spending under control because that's the root cause of our problem." In those days, Ryan was a Tea Party hero. Back then, Democrats venomously denounced him for warning that the giant entitlement programs were devouring the federal budget and had to be reined in. 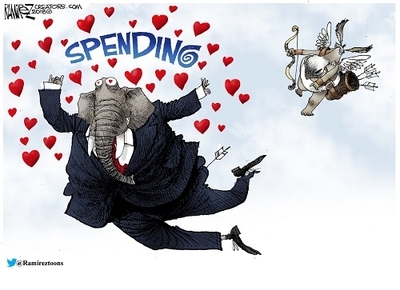 Just in time for Valentine's Day, Republicans agreed to a budget deal that will add hundreds of billions of dollars in new federal spending. Now Ryan is just another profligate GOP spender, one in a long line of Republican deficit hawks whose squawk, impressively fierce, turned out to be mostly for show. It's an old scam, and many earnest voters always fall for it. Those Tea Party rallies in 2009 and 2010 were electric with grassroots enthusiasm; when voters surged to the polls to elect Republican candidates, they believed they were empowering a party that agreed government was too costly and overbearing. Fifteen years earlier, voters had believed the same thing. In 1994, Newt Gingrich and his band of GOP insurgents swept to power behind their "Contract with America," vowing an end to "government that is too big, too intrusive, and too easy with the public's money." Yet then as now, the spirit of reform didn't stand a chance. Government got bigger. Insurgents were coopted. And Republicans forfeited their moral authority. America is drowning in red ink, and the national debt — $20.5 trillion and rising by the week — is an onrushing calamity. The Tea Party really cared about that threat and for one brief, shining moment, so did the Republican Party. But the moment passed, and power corrupted.